From 1999 to 2006, Honda made a car called the Insight. From 2008 to 2014, Honda made a car called the Insight. 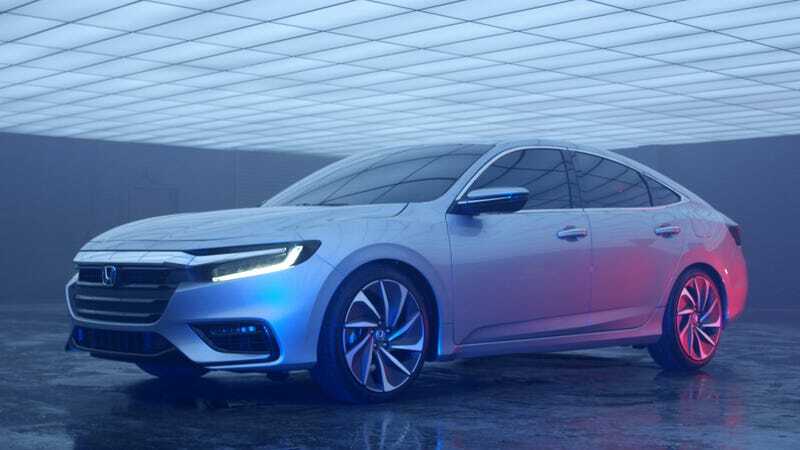 And from 2019 onwards, Honda will make a car called the Insight. These have all been vastly different cars. This needs to stop. Don’t get me wrong, Honda should definitely keep on building fuel-efficient and electrified cars forever and ever amen. But this will be its third attempt at making some sort of hybrid, slapping an “Insight” badge on it, and calling it a day. The first Insight was a weird tear-dropped shaped first-generation hybrid that was remarkably fuel efficient, and which very few people bought. Because who the hell wants a weird tear-dropped shaped oddball at the end of the 1990s. Nobody bought that, at least partially because it was bad, so Honda killed it and futzed around with an Accord hybrid and Civic hybrid for a while, which nobody wanted, either. The second-generation Toyota Prius was meanwhile selling like hotcakes, so with that in mind Honda set out to make a new hybrid. It decided to make it look like a Prius clone, and naturally, it decided to call the car the Honda Insight. That car sold well enough in Japan, but very few other people wanted it, and compared to the Prius it was also bad. So Honda killed that one, too. This new Insight, debuting as a “prototype” in a couple of weeks at the Detroit Auto Show (this is what Honda calls its near-production concepts) is yet another hybrid. Honda, however, is extremely adamant that this one will not be bad. In fact, it claims that it might even be good. To be frank, it looks like the 2018 Honda Accord and the new five-door faux-liftback Civic did the fusion dance from Dragonball Z. I think it looks too much like an Accord, overall. It will be “positioned above the Civic” (like an Accord?) and will be slightly “upscale” (like an Accord?) and will also be a “Honda” (I think like an Accord?). Honda, however, takes great pains to say that the car won’t be like previous Insights. It says the new Insight “takes an entirely new approach,” and that it offers competitive fuel economy “unlike the first two generations of Insight,” which is just a beautiful self-own. But it doesn’t have to be this way, Honda. You don’t have to keep calling it the Insight. You don’t have to keep reminding everyone of your past failures. You don’t have to be piling on your owns in the hopes that we won’t do it for you. It’s time to call the Insight something else. Just call it something else. Call it a Hyflyer. Call it a Super Efficiency Funmobile. Call it a Dave. Just don’t call it an Insight. Please.